Usually, when we are talking about homebrew around here, we mean building your own equipment. However, most other people probably mean brewing beer, something that’s become increasingly popular as one goes from microbreweries to home kitchen breweries. People have been making beer for centuries so you can imagine it doesn’t take sophisticated equipment, but a little automation can go a long way to making it easier. When [LeapingLamb] made a batch using only a cooler, a stock pot, and a propane burner, he knew he had to do something better. That’s how Brew|LOGIC was born. There are many ways to make beer, but Brew|LOGIC focuses on a single vessel process and [LeapingLamb] mentions that the system is akin to a sous vide cooker, keeping the contents of the pot at a specific temperature. Honestly, though, we think he’s selling himself a bit short. The system has a remote application for control and is well-constructed. This isn’t just a temperature controller thrown into a pot. There’s also a pump for recirculation. The common stock pot gets some serious modifications to hold the heating element and temperature probe. It also gets some spring-loaded clamps to hold the lid down. Expect to do a lot of drilling. The electronics uses an Arduino, a Bluetooth board, and some relays (including a solid state relay). The finished system can brew between 5 and 15 gallons of beer at a time. While the system seems pretty good to us, he did list some ideas he has for future expansion, including valves, sensors for water level and specific gravity, and some software changes. After reading that the system was similar to a sous vide cooker, we wondered if you could use a standard one. Turns out, you can. If you want to make better beer without electronic hacking, there’s always the genetic kind. The robot is one part cooler and multiple parts robot, controlled by an RC controller. Bruce Strauss’ Colebot robotic cooler uses an Arduino as the brains for serving drinks and sits on a RC wheelchair platform for maneuverability. 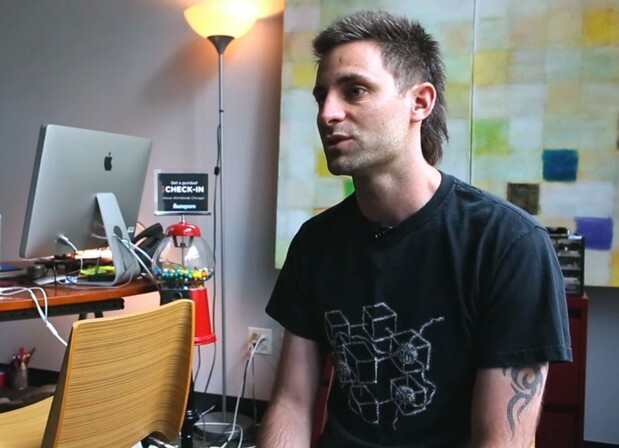 "There's something we miss when everything becomes virtual and goes online," says Tyler DeAngelo. "Tactile-ness gives it something that is more interesting and a deeper connection and makes it more meaningful." The ad executive invited us to Havas Worldwide's Chicago offices to show off his latest creation, and with Fifth Avenue Frogger, the Check 'N Chew Foursquare gumball machine and the Buzzed Buzzer under his belt, we took him up on the offer. His latest creation was born of the same desire to bridge the physical and the virtual. Created for a beer client, the bottle opener has Arduino Nano-based circuitry built-in, which connects with an Android handset via Bluetooth, sending texts to friends when you crack open a bottle. "I'm definitely not the first person to say this, but creativity comes from finding meaningful relationships between things that already exist," explains DeAngelo. "Nothing I'm doing is going to change the world. A lot of the stuff I do is wasting people's time, but I still think that making someone think differently or making someone laugh or have fun -- wasting time is an important piece of innovation." It's also, naturally, an important part of engaging a public increasingly immune to sales pitches. Getting people's attention in an ad-saturated world requires a lot more than clever jingles. "i think the most innovative things in the media field should be happening inside ad agencies right now," DeAngelo adds. "If they're not, those who aren't innovating are going to be dead." [Kerber] got his hands on a classic 1950′s General Electric fridge, and converted it into this classy vintage kegerator. 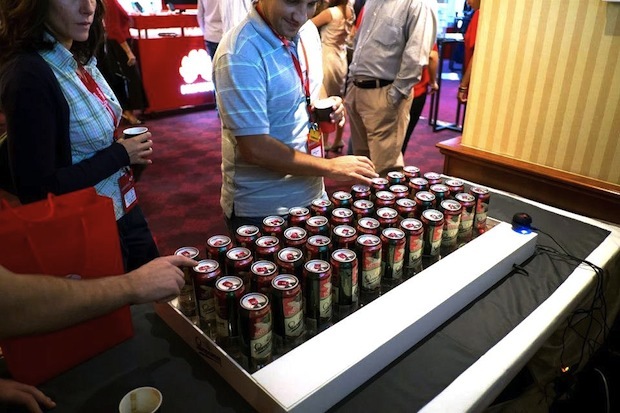 Do you know what you get if you combine 44 beer cans with an Arduino board and a Raspberry PI ? I tell you : fantastic user engagement! It happened at Webstock, event which took place in Bucharest this month. Staropramen, one of the sponsors of the event asked us for an innovative way to offer a trip to Prague to one of the event’s guests. So, we came up with a keyboard made out of 44 Staropramen beer cans. Each beer can was a key, and whenever someone touched it, the corresponding letter appeared on a large plasma screen (just like any regular computer keyboard). And the surprise was fantastic! The user experience and engagement overcame any expectation. Every single person who attended Webstock tried the keyboard and participated to the contest. Other hardware we used was the Sparkfun MPR121 Capacitive Touch Sensor Breakout Board (4 of them, each controlling 11 beer cans) and one Sparkfun MP3 Trigger Board which controls the sound effects. (feel free to use them if you want, or download directly the photos as a zip archive). [Webstock] is the biggest blogging and social media event in Romania. [Robofun Create] is a Romanian company specialised in creating cool on-demand technology products. Although beer is generally a good way to get people to come to your trade show booth, [Robofun.ru] decided to put a new spin on things. Instead of (or possibly in addition to) giving out beer, they decided to turn 40 Staropramen beer cans into a keyboard. This was done using an Arduino hooked up to four Sparkfun MPR121 Capacitive Touch Sensor Breakout Boards, allowing them to act as keys. These inputs are translated via the Arduino into a standard output (we assume USB) that can be plugged into any computer. Additionally, a Sparkfun MP3 trigger board was used to control the sound effects. Rounding out the build, a Raspberry Pi computer was used to run the human machine interface, a large plasma display. Be sure to check out this keyboard in action after the break. If this isn’t enough alternative input fun, why not check our post about how to make a banana piano and giant NES controller. Sure, Red Bull may have gotten a lot of attention by sponsoring Felix Baumgartner's space dive, but it's not the only beverage-maker that has made some great accomplishments possible. The Prague-based brewery Staropramen was a sponsor at the recent Webstock 2012 conference, where the folks from Robofun Create showed off this so-called Beer Keyboard built with the brewer's backing. As you can see, it's more beer than keyboard, with 40 cans of Staropramen serving as "keys" that just need to be gently pressed to input a letter. To make that actually work, Robofun paired an Arduino board with some capacitive controllers for the base, and connected that to a Raspberry Pi that linked the keyboard to the TV. Unconfirmed reports suggest that the keyboard has since gone missing. Head on past the break for a video. 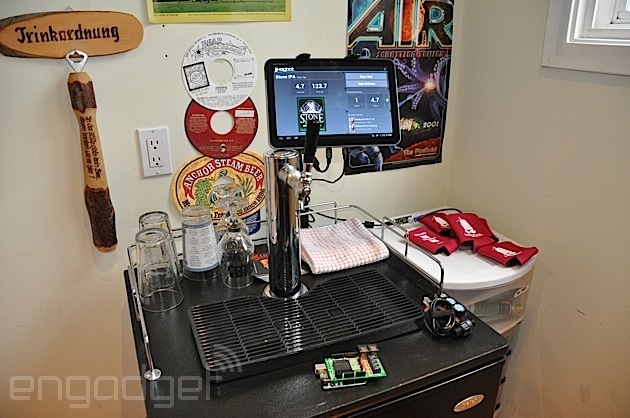 Beer Keyboard combines Arduino and Raspberry Pi... and beer originally appeared on Engadget on Tue, 16 Oct 2012 20:36:00 EST. Please see our terms for use of feeds.